Happy Pi Day! Are you going to be making a pie today? Possibly stitching circles? Eating a pizza? Have fun with anything circular. To acknowledge Pi day I am posting all of my completed circles in my NY Beauty project. These are the new pieces added this week. Slowly, but surely, I am getting this UFO finished. Why did I wait so long? Once I finish all of the blocks I will arrange a layout. My sister from Alaska (IG alaskanquilter) has been in town this week and we have shared some fabulous quilting hours together. She brought some of her completed tops down to quilt. First up was a top that her daughter made. She is a brand new quilter and this is her first quilt top made in a class she took. Isn't it lovely? We then moved on to a dog quilt for one of my sister's furry friends. Lastly, she brought along her En Provence mystery quilt. It was fun to compare hers with mine before she got it quilted. This turned out beautifully. I need to get mine quilted next. We celebrated her birthday with a trip to one of our favorite quilt shops. She was able to take advantage of their 30% off birthday discount so significant stash building was accomplished. This was the birthday postcard that I made for her this year. The cactus are in bloom in the desert so thought this fit the season. Our days have been glorious with temps in the 80s for the last week. It has felt fabulous - especially with the longer daylight hours. Spring is definitely here with the migrating birds back and the tortoises out of hibernation. I'm ready for it. Happy St. Patrick's Day to all. Corned beef with cabbage????? Linking up this week with Val's Quilting, Freemotion By The River, Midweek Makers and Quilts My Way. Happy Pi Day to you, too, Mary! I just love your NY beauty blocks. Gorgeous! And how fun to have your sister with you, sharing in your quilting love. She has made some great quilts! I am ready for spring here, but am going to have to wait a bit. Winter decided to return this week. Sounds like you and your sister are enjoying her visit, doing all sorts of fun things. I love your NY Beauty...those blocks are amazing. Happy Pi Day and Happy St. Patrick's Day, too! Happy Pi day to you! We'll be eating pizza tonight. No pie as we are limiting sweets right now. You NY Beauty is stunning. You should feel proud. Sounds like you are having lots of fun with your sister. Keep it up! Happy Pi day to you! It sounds like you two are having a wonderful and very productive time together. I love the quilts she brought with her to quilt. Several of the ladies I sew with have made or are making an En Provence quilt. That is an ambitious project. Happy Pi day! I love corned beef and cabbage, with new potatoes and soda bread. Great quilting finishes! I love your NY Beauty blocks. I think that is a project that is hard to stick with for very long. I always need a break from paper piecing after a few blocks. No cooked cabbage for me!! Yuck! I love raw cabbage though. I'll have corned beef and potatoes even though I'm not Irish. The rest of the corned beef will be a side treat with my salad every day for lunch. And a happy Pi day to you! Your New York Beauty blocks are fabulous! How nice that your sister has been able to visit and enjoy some warm spring weather. We're celebrating Pi day with a nor'easter and I've been working on my Quilty 365 circles, getting them together into a top. Cabbage soup on the menu! This math teacher wishes you Happy Pi Day! NYBeauty certainly is a beauty. So glad you and your sister got a lot of quilting completed. I am sure you had some wonderful visiting time also. Corned beef and mashed potatoes will be on our menu either Friday or Saturday. I did make some Irish Soda Bread on my snow day today. Hoping for Spring here. Oh I am green with envy. Love your New York Beauty blocks. How fun to have the sister from the Great Frozen North. I am sure she is enjoying the lovely weather. Love your New York Beauty blocks. Lovely to look at, but not something I would ever tackle. Your sister's first quilt is a beauty!! We woke up to about 8" of snow this morning, and I had the pleasure of relocating much of it. Off to retreat tomorrow am, so I needed to be able to get out! We had our corned beef and cabbage a couple of days ago because I won't be home on St. Patrick's Day. Leftovers tonight in the form of corned beef hash, I suspect. Love those New York Beauty blocks! Great quilts by your sister too! What a fun time you must be having! Sounds like it was a fun week! Thanks so much for quilting my quilt top Mary Pat! I love the pattern you guys picked out. Your New York Beauty blocks are gorgeous. I'd love to try that pattern some day...when I have much more experience! Well, you had a great time!! Lol. All of the quilts are just gorgeous, Mary! Love your NY Beauty. What a fabulous first quilt made by your niece..
Lucky Furry Friend getting a special quilt. Your sisters En Provence is beautiful..
how nice to be able to take her shopping at a bargain price for her BD.. It WAS a fun time! Thanks so much for three fabulous days!! You have inspired me with your NY Beauty blocks; think I'll go home and play some more! Next adventure - a summer sisters' quilting retreat in Alaska? I promise the weather will be warm! Your New York Beauties are spectacular. I have that on my list of quilts to do. I love your choice of colors. So pretty. That En Provence turned out great. Thanks for sharing. Thank you for this lovely show and tell, a true treat for this quilter's eyes! I just love your NY Beauty blocks, so bold and vibrant. Happy St. Patrick's day to you. Very tasty pi(e)! 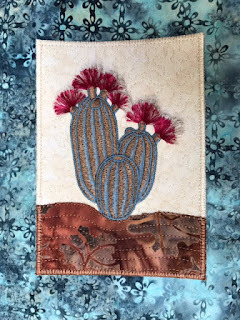 Love the barrel cactus. The 3D flower blossoms are perfect. No corned beef and cabbage this year. Friday is Guinness Beef Stew! :o) Love your shamrocks. Happy St Patrick's Day to you. What gorgeous NY Beauty blocks...and your sister's first quilt wow! Let's just say my first quilt was a much more humble affair, lol!! Great job!! Great way to celebrate Pi Day. Your blocks are stunning. I've always wanted to get into making that quilt but......alas, life has made that impossible for now! Oh my what a gorgeous NY Beauty! Enjoy time with your sister. I also have company from Australia and have been doing a bit of California sightseeing with her. The NY Beauty is looking great! Feels good to be finishing it, doesn't it? And what a fun time with spent with your sister - so lucky to have one that quilts too! Your New York Beauty blocks are beautiful Mary! Looks like you are having a wonderful time with your sister and how neat that she quilts also. Happy Saint Patrick's Day! Our intermediate kids celebrated pi day! So fun!! Oh your first highlighted quilt is amazing!! And thanks for sharing your st patty's tabletopper at Tuesday Archives!! I did not celebrate Pi day with a pie....I started a new Diet 2 weeks ago and it is pretty much Vegan.....I've only lost 5 lbs but my blood pressure is awesome! lol....don't know if its worth giving up meat, sugar, caffeine, and wine....but I'm going to continue for the full 21 days or maybe all of Lent....we shall see....Your Sis and niece's projects are lovely and I know you have been loving her visit.....how long do you "get to keep her?" You had a wonderful time with your sister, Mary !!! I love all of your quilts !! Great job !